If you're itching to find out what using HTC's Vive headset in a huge room feels like, one midlands-based retailer is giving you the chance to find out. Overclockers UK is modifying its Staffordshire showroom to create a 20 metre-squared (or 5 x 4 metre) room. 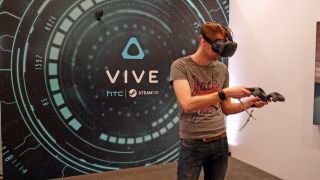 HTC recommends a minimum play area of 1.5 x 2 metres (or 5 x 6.5 feet) to allow the Vive's cable to reach every corner of the playing space, so Overclockers' showroom is a decent size to test out the Vive's capabilities. Opening on March 19, Overclockers' Room Scale VR Experience demo will become a permanent fixture at its flagship store. There, you'll get the chance to play one of HTC's 15-minute demos on the Vive that will be staged on the OCUK Kinectic VR Gaming PC, which is powered by an Intel Core i5-6500 CPU paired with an Nvidia GTX 970 packing 4GB of video memory. The demos are: Into The Blue, Tiltbrush, Space Pirate Trainer, and Job Simulator. If you're impressed by what you see, you'll be able to pre-order the Vive in-store with headsets scheduled to be delivered in May. It costs £689 in the UK ($799 in the US/around AUS$1,071), not including the price of a meaty PC to run it, of course. Head over to Overclockers' website to book a demo.